Cyber Seniors is coming to Whitehorse! If you asked your grandparent if they knew how to use the Internet, what would they say? What if you asked them to chat with you on Skype, or be your friend on Facebook? While many of our parents and grandparents are hopping on the technology bandwagon these days, thereâ€™s still a huge generation gap between the old and the young. Cyber Seniors is a documentary that follows one group as they try to bridge the generation gap by employing teenagers to teach senior citizens how to use social media. After all, if thereâ€™s any generation that knows everything there is to know about social media, the Internet, and technology, itâ€™s todayâ€™s youth. 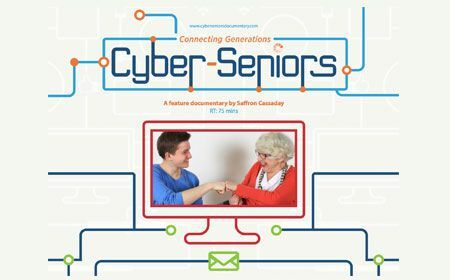 Cyber Seniors is a movie about stripping down the traditional model of the old teaching the young, and allowing both youth and senior citizens to become empowered. In this film, a group of senior citizens volunteer to learn how to use the Internet and social media in order to connect with their children, grandchildren, and other seniors. Their teachers? A brave group of teenagers who have all the social media expertise a senior could hope for. BYTE and the Yukon Film Society are co-hosting a community screening of Cyber Seniors at the Old Fire Hall in Whitehorse on Friday, December 5th at 7:30pm. Itâ€™s a humourous film that will inspire youth to teach their elders how to use important technological tools. Admission is by donation, and weâ€™ll have free snacks available. Weâ€™re also hosting a post-screening discussion with the audience about the role of technology and communication in todayâ€™s world. Seniors and youth are encouraged to attend. Hope to see you there!